In a Nature Communications paper published today, an international research team including UConn’s Bernard Goffinet used DNA-sequencing technology to reconstruct the family tree of mosses, which go back at least 400 million years. Based on comparison of 142 species of moss from 29 of the 30 orders of mosses in existence, the researchers were able to re-evaluate what was known of moss evolution and suggest an overall phylogenetic (family) tree. The resulting evolutionary history of mosses also represents a more robust framework to study the evolution of major morphological innovations. The study analyzed hundreds of genetic sequences from the nuclei of the mosses but also from other cellular components, or organelles, called plastids and mitochondria. To their knowledge, the researchers write, this is the first study to take such a holistic approach. The team found that mosses have been extremely dynamic throughout their evolutionary history – much more so than seed-based plants. The results also give insight into the rate of evolutionary changes, especially big changes that result in the creation of different branches of the phylogenetic tree. On the whole, mosses tend to have reduced structures, and they reproduce with characteristic, alternating forms, with the most familiar and recognizable of the forms called gametophytes. 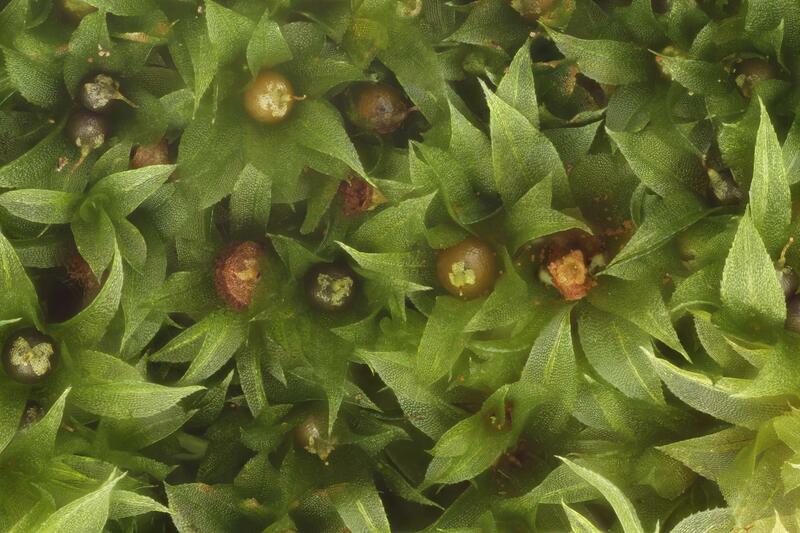 Next time you see some moss, you’re probably looking at it in its gametophyte stage of life. Mosses are remarkably diverse, most notably in the structures that aid in the release of spores for reproduction. These differences are the basis for scientists’ categorization of mosses into five major groups. Mosses use spores, rather than seeds, for reproduction. The structure in the picture below, for example, is from a moss that grows on the African Savanna. In its dry form, the flower-like cup – called a peristome – extends upward, supported by the twisted stalk. As soon as it rains, the tissues absorb water and the stalk unwinds, bends downward, and hides the capsule among the leaves to prevent dispersal of spores when the air is moisture. Mosses are widespread and are found in all non-marine ecosystems across the globe, often playing critical ecological roles, such as in nutrient cycling. Having been around for at least 400 million years, and having maintained what seems to be a fairly simple architecture, mosses were long thought to be “sphinxes” of the past or evolutionary dead ends, but are now emerging as highly dynamic lineages. Due to their long heritage, mosses have been faced with great changes over the course of their existence, which may have led to their fascinating diversity. From external forces such as mass extinction events, to changes in global temperatures, or internal forces such as whole genome duplications, mosses have persisted and adapted to numerous challenges. Their diversity reflects major and unique abilities to withstand and adapt to challenging environments such as those on rock surfaces and tree trunks. Mosses are also adapted to changeable conditions, whereas very few flowering plants can survive without roots and rely solely on rain or even moisture supplied only by fog not only to water them but also to “feed” them, Goffinet says. Studying the evolution of mosses has been a challenge until the advent of DNA-sequencing technology, partly because of the absence of mosses in the fossil record, but also because of their great diversity. Even with DNA technology, many ambiguities have persisted as the DNA studies contradict previous inferences. Goffinet says DNA-based inferences are critical to resolving the relationships of dynamic lineages such as mosses. “The focal point of the study is to address the evolution of the peristome, a structure that controls or aids in spore dispersal,” he says. “This structure is to the moss evolutionary systematist what the flower is to the flowering plant systematist: it is thought to inform us on relationships. Mosses with the same peristome architecture should be more closely related than mosses with different peristomes. “Since morphology may be misleading,” he continues, “DNA sequences are seen as an independent source of information from which to reconstruct or infer relationships, and thereby test hypotheses. DNA may reveal signatures of shared ancestry that have been erased from the morphological space, due to convergent or reverse evolution. Studies like this rely on biodiversity collections at UConn and elsewhere as sources of tissue for DNA extraction, says Goffinet, and without these collections it would not be feasible to perform this research. This study was funded by National Science Foundation (DEB-1753811) 2018-2021.